Here's one of the superb all spins game from Playson which you can play. If we all had a nickel every time someone said that they wish it would be Christmas every day, then we would all be rich, but miserable because it can't be Christmas every day. 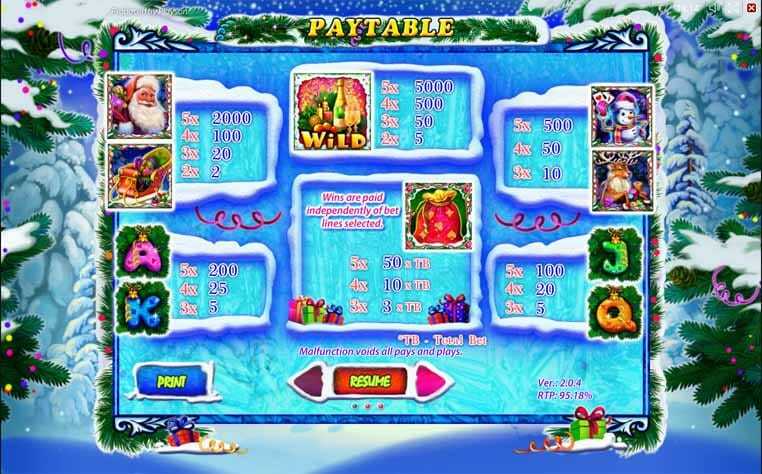 Although that is a wish that many festive lovers dream to come true, its not something that could possibly be done...until Playson has manifested fantastic slots games that can actually make that dream come true! 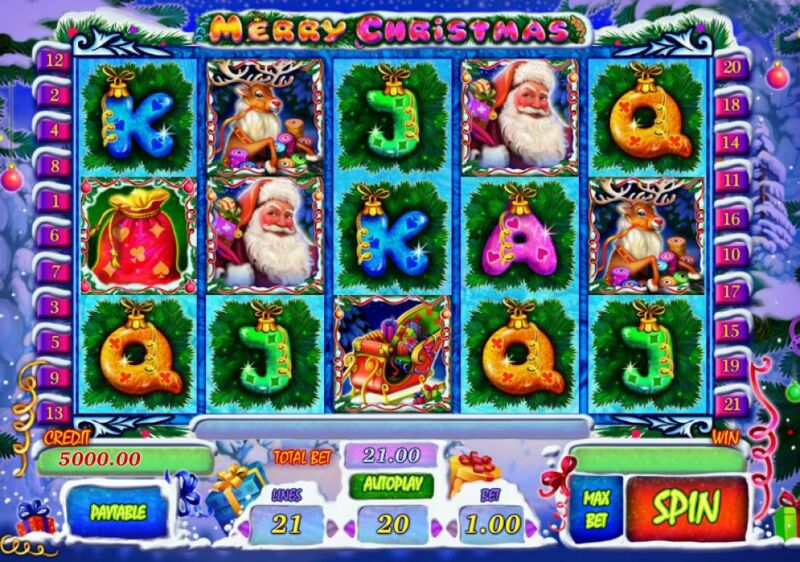 Filled with crackers, presents, decorations, and big traditional Christmas trees, you can be sure that the slot game, Merry Christmas, will give you big winnings that Santa can put in your festive stockings! Playson may not have been around for very long, but the games that they have already created and published show fantastic potential in the casino industry. The developers never set the bar low, and make sure that all of their products are top notch when it comes to gameplay, visual graphics, and audio features. Furthermore, Playson are not afraid to dabble in the wide range of themes that can captivate any casino game player from all over the planet. 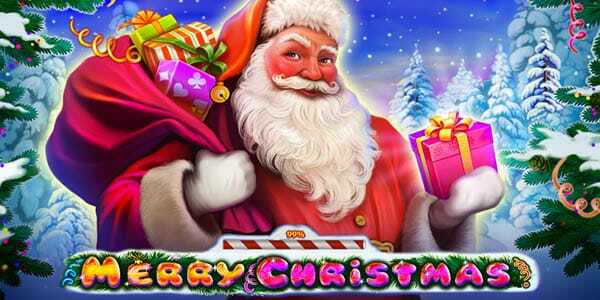 After gaining a high amount of popularity from their other games such as Riches of Cleopatra, Dracula's Family, and Wild Hunter 3D, there is no way that you give a thumbs down to Merry Christmas! To add more to your festive treat, there are a bunch of WILDS, SCATTERS, and BONUS FEATURES that you ought to look out for. Champagne Bottle WILD: Substitutes all of the base symbols except for the SCATTER logos. SCATTER Logo: Triggers 15 free spins whenever 3 or more of them appear simultaneously on the reels, which also offer you BONUS FEATURES. BONUS FEATURES: The sleigh and Santa icons will become WILDS when you're playing a free spin. Also, another Christmas tree icon will occur on the 1st and 5th And if 2 appear at the same time then you will get the chance to play the special bonus game. Bonus Gamble Game: You choose 1 out of the 2 presents that would contain a stack of coins that will double your wins. The gameplay is quite linear and easy to follow, which is very good if you don't want to be agitated with the number of twists and sudden BONUS FEATURES that appear in many other online games. And when you want to get into the spirit of Christmas, you don't want to feel agitated, you want to feel happy and jolly! Playson has made a festive explosion with Merry Christmas, as it contains so much Santa Claus related visuals and audios that will follow you in your sleep. So, if it's the middle of Summer and you want to feel like you're in the middle of Winter, load of Merry Christmas on your favourite device today and enjoy the many prizes that you would win!